We have a new feature attached to special breaks, CSB Confidence Pools! A confidence pool is where you make your predictions of each of the winners on a slate of games on a specific date and attach a number value to each pick representing your “confidence” in that pick. For instance, if you are most sure the out of all 15 games on a day, that Mets are going to beat the Cardinals, you’d assign that as your “15 point” pick. If the Mets win you get 15 points. If you are least sure that the Rangers will beat the Astros, that’s your “1 point” pick. The website will look at everyone’s entries and automatically calculate what team won each game, and the number of points you got for each win. The winner of the pool is the person with the most total points! Scores are now automatically updated every 15 minutes! In the event of a tie, we have a tie-breaker entry, for baseball games it will be the total runs scored in all games on that slate for that day. Below are some helpful hints and things to keep in mind! 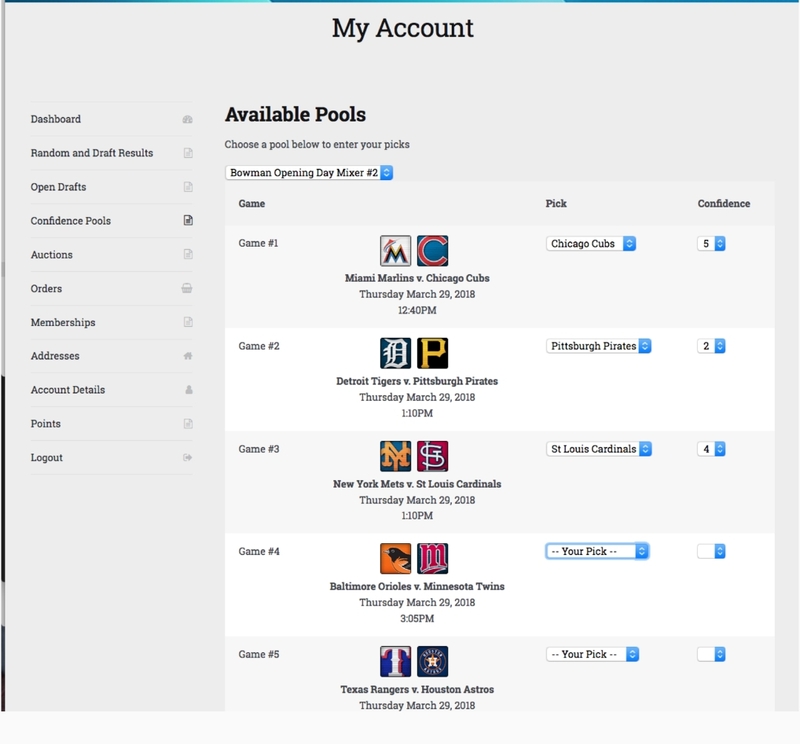 The Confidence Pool picks area is in your “My Account” – “Confidence Pools”. From there you’ll be able to make picks and see your entries! Rained out games will result in a zero score, so be careful when assigning your confidence points! If you buy multiple spots in a break, you’ll be able to make multiple separate entries! You’ll want to make each entry different so you have a better chance of winning. Don’t submit the same picks 3 times or it’s exactly the same as only entering once! Once you submit an entry you can edit it up to the deadline! There will be a deadline for entries for each pool. Right before the first game of the day starts. If you don’t make an entry by then, you won’t be in the contest, so don’t miss it!